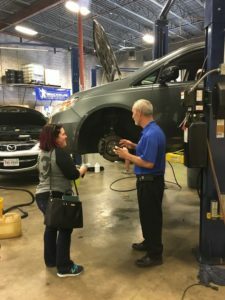 If you are new to an area or taking on responsibility for your vehicle for the first time choosing a good automotive repair shop can be quite overwhelming. Ask yourself what is most important to you: quality of work, customer service, price, the list goes on and on. A good auto repair shop should be a combination of quality, customer service and pricing. Usually, one or two of these will generally outrank the others. 1. Ask your family and friends for referrals. If you someone you know gets excited about referring you to their repair shop you can most likely expect a great experience. Ask about whatever is important to you and your vehicle. Any good shop and service adviser will be patient and answer all your questions. Remember you generally get what you pay for. A good auto repair shop will hire experienced and highly trained techs. Those techs have the knowledge and on the job experience to diagnose difficult mechanical problems and properly perform repairs and maintenance services. Care care is a great investment and regular maintenance a few times a year costs far less than an average monthly car payment of $500. My wife and I are looking for a car repair shop in town, so thanks for the tips. I like that you suggest asking friends and family for referrals. We might have to try asking our new neighbors if there is a specific shop they visit and if they’d recommend them or not. I’m glad to hear the article was helpful. If you have any automotive questions we will happy to help.